Travelers find new friends, the beauty of nature, and the excitement of gold in northern California. The road stretched endlessly before us. Familiar hills of Arkansas and Oklahoma now lay far behind. The miles slipped steadily by as we drove hour after hour across the Texas plain, but we knew we were only getting started. We were on a prospecting and treasure hunting expedition that would require traveling almost 5,000 miles, and spending many nights in camp before we would again see the comforts of home. Still, I couldn’t help thinking how much easier it was for us than for those first 49’ers who traveled this same route by wagon and horseback in their quest for gold. Our purpose for this trip was really three-fold. My treasure hunting buddy, Jay Gill, and I had planned for months to make a gold prospecting trip to northern California. I also wanted to visit with my father while we were there. He is now in his 80’s, but acts like he thinks he’s still a teenager. The third purpose, which came up after our trip was already planned, concerned my son, Monty. He had won an academic scholarship from a laboratory in Richland, Washington. He would be paid for working in the lab and earn a semester of college credit at the same time. The deal was just too good for him to pass up. And I promised his mother that I would see him reach Richland safely. This would mean driving a few hundred more miles than originally planned, but what the heck, we were on vacation anyway. I have been a treasure hunter for almost 40 years and have been very active in just about every phase of the hobby/profession. But when it comes to prospecting for gold, I consider myself strictly a greenhorn. The only actual prospecting experience I have had previously took place over 30 years ago when I spent a few months in the Sierra near Twain Harte, California. Fortunately my partner, Jay Gill, was a seasoned old veteran. He has prospected in many different places over the years, including the Colorado Rockies, and even in the jungles of Ecuador. I was depending on him to teach me the ropes and get us off to a good start. We reached Gallup, New Mexico long after my usual bedtime and stopped to grab a few hours sleep. As a spectacular desert sunrise silhouetted craggy hills in the East, we headed north on Highway 666. This route took us through the eerie lunar terrain where Shiprock and skeletal remains of other long dead volcanos dominate the landscape. Jay and I had traveled this way on another treasure hunting trip back in the spring. But, Monty had never seen anything like it and was really impressed with the spectacular scenery. We soon passed through the south-west corner of Colorado and on through the beautiful canyon country of Utah. By the time we had grown too sleepy to drive any farther we were in the Snake River country of Idaho, where we stopped for the night. We crossed the Snake River Plain early the next orning, along the old Emigrant Road used so many years ago by those early pioneers headed for Oregon. Again my mind drifted back, as I tried to visualize what it would be like to traverse this harsh terrain day after day on foot or in a wagon. This was only our third day on the road, and already I was becoming weary. But how could I really understand the feelings or taste the hardships of those hardy souls who had to endure months of hot, dusty travel, while we crossed the same distances in mere days of air conditioned comfort. We reached Richland, Washington in the afternoon and got Monty moved into his new apartment. Jay and I spent the night with him and got some much needed rest. With a bit of sadness I said my goodbyes to Monty early the next morning, knowing it would be several months before I would see him again. But he was in good spirits and looking forward to a new experience. As Jay and I drove south across Oregon in view of beautiful snow-capped mountains, the spirit of adventure gradually returned to me also. We reached Tulelake, California, where my father lives, that afternoon. After visiting a while, Jay and I decided to see what the coinshooting was like here in northern California. The Silver Sabre II I was using, and the Tesoro Toltec 100 Jay had brought, performed quite well. By dark we had dug a little silver and a large number of modern coins. But it was gold that we had traveled thousands of miles to find, and we were anxious to reach the Klamath River and do some serious prospecting. Early Sunday morning Jay and I headed west on Highway 161 which runs along the state line just inside the northern border of California. As we drove through a waterfowl refuge on Lower Klamath Lake we noticed a road sign which stated “SLOW DUCK CROSSING.” This was the first time I had ever seen a “duck crossing” sign, but it was no joke. We had to slow down and even stop at times as thousands of ducks crossed the road, some flying and some walking. It was a sight to thrill anyone who loves to view wildlife in their natural habitat. We checked our old road atlas and considered taking a shortcut over the mountain on a Forest Service road, even though it wasn’t shown on the new highway map we had. We stopped at a ranger station to check on the situation before turning off the highway, but the station was closed. We decided to take the short-cut anyway since it would save us about 50 miles of driving, and after all, Jay and I were no strangers to back country roads. Most of this road was dirt or gravel, and after reaching the top of the mountain side roads branched off in all directions. Few of the intersections were marked and it was difficult to tell which way we should go. At one junction we chose the wrong fork of the road and soon found ourselves at a dead end near the bottom of a canyon. It was bow hunting season in the area and we met a deer hunter who gave us directions on how to get down the mountain to the semi-ghost town of Montague. We made it this time without getting lost again. Even though we had been side-tracked for a time, the drive over the mountain was one of the most interesting parts of the trip. Wildlife was more plentiful here than on any other stretch of road we had traveled. Chipmunks and various species of birds were everywhere. We saw numerous black-tail deer and took some good pictures of them. The scenic views were also spectacular, with snow-capped Mt. Shasta rising in the background. We arrived at Happy Camp in mid-afternoon and stopped at the New 49’ers headquarters to get information on where to camp and pan for gold. The first person we met was Dave McCracken. 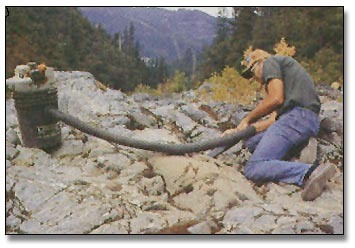 Dave was in the process of giving a seminar on placer gold recovery methods. Not knowing what was going on, Jay and I had barged inside right in the middle of his seminar, as if we owned the place. Dave was very gracious about the whole thing, and after a brief conversation and introductions all around, we sat in on the rest of the seminar. After the seminar (which proved to be very informative), we talked a while longer and Dave told us we could spend the week as his guests and work New 49er Club claims. Bill Stumpf, the organization tour guide, directed us to a campsite for the night on Elk Creek Road just south of Happy Camp. We quickly set up camp and started panning on the nearby gravel bar. I recovered several flakes of gold from the first pan full of material, and this continued to be the case with every pan the entire week we were on the Klamath. 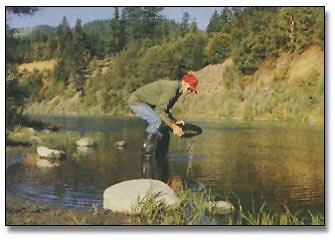 The next day Bill led us several miles upriver and showed us where we could camp and pan for gold. He even loaned us his MACK-VACK to use while we were there! 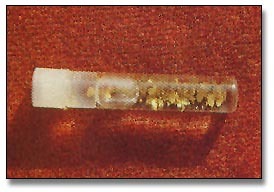 The MACK-VACK is a vacuum type tool for sucking dirt and gold out of cracks and crevices and into a five-gallon bucket. It proved to be very effective and we used it to good advantage in several locations. After showing us around and pointing out a few spots he thought should be productive, Bill wished us luck and went on his way. We set up camp near two other miners who were working with high banking units. One of the miners was named Don who said he lived in Klamath Falls, Oregon. He worked for the railroad and mined gold during his vacations and days off. Don was a very outgoing person who tried to be friendly and helpful from the very first meeting. Don also hunts nuggets with a detector and had some nice specimens to prove it. The other miner was Jerry Snell from Eugene, Oregon, and he works for a timber company. Jerry is more reserved and waits until he has time to evaluate a person before committing himself. But after he gets to know someone and finds out that they are O.K. he will help them any way he can. Jerry showed me a nice collection of gold he had recovered from his high banking operation on the Klamath. A large black bear visited our camp every night, but he didn’t disturb anything. He would just leave his spoor and then walk on up the river. He was probably checking out every miner’s camp along the way to see what they were up to. After all, this was HIS territory and we were just trespassers. If I had met the old boy on the trail there wouldn’t have been any question about who had the right of way. Don and Jerry said they had seen him walking along the river about 50 yards from camp the evening before we arrived. He remained out of sight the few days we were there. But just knowing he was around added a lot of atmosphere and a sense of wildness to the country. Our side of the river had been heavily worked, both by the early miners and in recent times. Jay and I looked the situation over and decided that with the limited equipment we had, our best bet would be to clean out overlooked crevices and pockets between the large boulders along the river. We had brought along a sluice box, but the river was so deep and swift along this stretch that we didn’t find a suitable place to set it up until the last afternoon we were there. By that time it was too late to pack our equipment the half-mile upriver to that location. So, we panned all the material by hand and recovered what gold we could that way. Gold panning was something I wasn’t very proficient at and I needed a lot of practice. After a couple of days of steady work I became a lot better at it. But I was never able to work a pan of material as quickly as Jay could. As I watched the sand and gravel swirling around in my gold pan I tried repeatedly to let my mind drift back in time and try to recapture the atmosphere of those early miners who first worked this river. Although the scenery was still wild and beautiful, and my muscles ached from the unaccustomed effort, the feeling I sought continued to elude me. Perhaps the sound of gasoline engines on the high bankers and the occasional airplane overhead held me too close to the present. After we had been panning a couple of days, Bill Stumpf and Gordon Zahara came by to see how we were doing. Gordon has been very successful nugget shooting with a detector in some of the old hydraulic mining areas nearby. The New 49ers contracts with Gordon to help members and guests become more proficient at nugget hunting and to guide expeditions into the field several days each week. I expressed an interest in some nugget shooting with the Tesoro Silver Sabre II I had brought along on the trip. I knew the Silver Sabre II wasn’t specifically designed for finding gold nuggets, but I thought it would be sensitive enough to do an adequate job. Gordon said he would be glad to take us on a nugget shoot, and we made plans to go the next day. As luck would have it, it was showering heavily the morning of our planned hunt. We met Gordon at the New 49’ers headquarters and discussed the situation over coffee. After watching the rain for a while we decided to cover our detectors with plastic bags and try it anyway. The clouds began to break up before noon and it turned into a nice day. Another man and his two teen-age sons accompanied us on the hunt, but they only stayed until about noon. Gordon is a veritable storehouse of knowledge concerning the gold mining potential of the area and the use of detectors in its recovery. He was more than willing to share that information with anyone who was interested and wanted to hunt. Of course he has his own special places he isn’t ready to take anyone else to, yet. One of the methods we used in our search was to rake down the steep sides of a shale bank and go over it with our detectors. Gordon was the only one who found a nugget that day, a small one about the size of a rice grain. We tested the Silver Sabre II on this small nugget and it detected it easily. I also had no difficulty detecting small hot rocks and galena crystals, which seemed to have about the same conductivity as a gold nugget. I believe I would have found a nugget with the Silver Sabre II if I had just been fortunate enough to have gotten over one. There is an old mine shaft near the area we were detecting and a trash dump from that time period. Jay and I hunted a while in that area and found several interesting old relics from the early mining days. Another impressive feature of the Klamath River country is the many different kinds of rocks and minerals found there. We often found small garnets along with the flakes of gold and black sand at the bottom of our pans. We also picked up a couple of nice pieces of jade and several other interesting rock samples. I believe this would be a prime area to do some rock hounding if a person could get this mind off gold mining long enough. The days passed quickly and before we realized it the time had come when we needed to pack up and start home. Jay is a fireman and had to report back to work the following week. We returned the borrowed MACK-VACK to Bill Stumpf and said our farewells. We were very grateful for the generous hospitality everyone had shown us. I wished to show my appreciation by giving Bill and Marcie and Gordon’s wife a few Indian spear points from Oklahoma and Texas. Bill wasn’t to be outdone, however, and before we left he handed me a beautiful gold nugget as a souvenir. By Saturday afternoon we were driving across the lonely Nevada deserts on our way home. The road stretched endlessly before us. Although we had traveled thousands of miles within the last few days, none seemed as desolate as this barren desert. I guess the last couple of weeks of strenuous effort and long days on the road had taken its toll. I had been trying the entire trip to go back in time and experience the feelings of those early pioneers and miners. Now, crossing the empty deserts of Nevada, almost totally exhausted, I was at least partially successful. It didn’t matter that we were traveling at 65 miles an hour. The horizons were so distant there was no perception of getting anywhere. We had somehow become caught in a realm where time was meaningless and the vastness of the land too great to comprehend. The chances of us ever reaching our homes began to seem hopeless. Yes, I had finally recaptured the feeling some of those early travelers must have experienced, but it wasn’t exactly what I had expected. In an effort to come back to reality, I turned to Jay and said, “It may not seem like it now, as tired as we are, but someday we’ll look back at all this and think of it as a big adventure.” Jay sat in silence for several moments as if contemplating the events of the past few days. “It has been quite an adventure”, he answered softly.